You have plenty of time before all the hard-drivin', wheel spinning, monster truck action rolls into Rosemont. 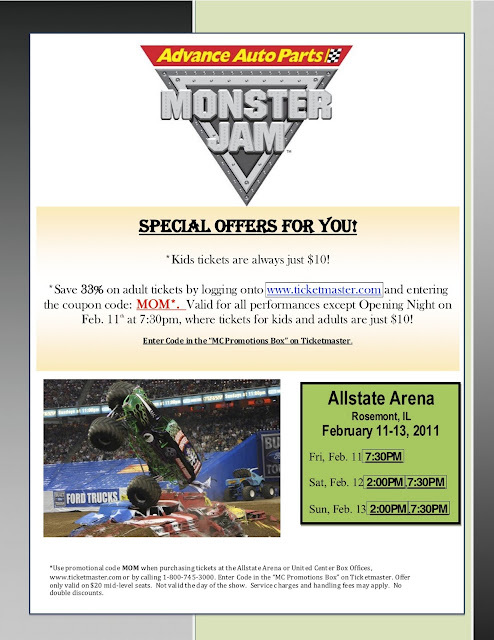 At ChiIL Mama, we will be pickin' our winner of a Family 4 Pack of Tickets to Advance Auto Parts Monster Jam on February 1st, as part of our Free Tickets Tuesdays. But you can enter to win right HERE and now. If you don't get picked, you're still a winner here. When you go to buy your tickets, enter the code MOM, for a 33% discount. Good luck!